As the day progresses, the nucleoside adenosine gradually increases in our brains, suppressing cell activity and causing feelings of fatigue. Approximately 75% of American adults drink coffee to counteract adenosine. Caffeine replaces the weariness with adrenaline, mental alertness and stamina. Unfortunately, caffeine can also be harmful. According to the Mayo Clinic, caffeine increases blood pressure which is especially dangerous for those who suffer from heart disease or are at risk of having a stroke. Caffeine also stimulates the production of gastric acids. These additional acids aggravate heartburn and over time damage the gastrointestinal lining causing gastritis or even ulcers. Whereas adenosine suppresses cell activity, caffeine stimulates it and this stimulation has been linked to muscle spasms, anxiety and insomnia. Caffeine’s adverse effects prompt a growing number of coffee drinkers to ask, “Is there a coffee with less caffeine?” Thankfully the answer is yes! The plant genus Coffea includes more than one hundred different species of flowering shrubs and small trees, but only three of these are commercially cultivated for coffee beans. 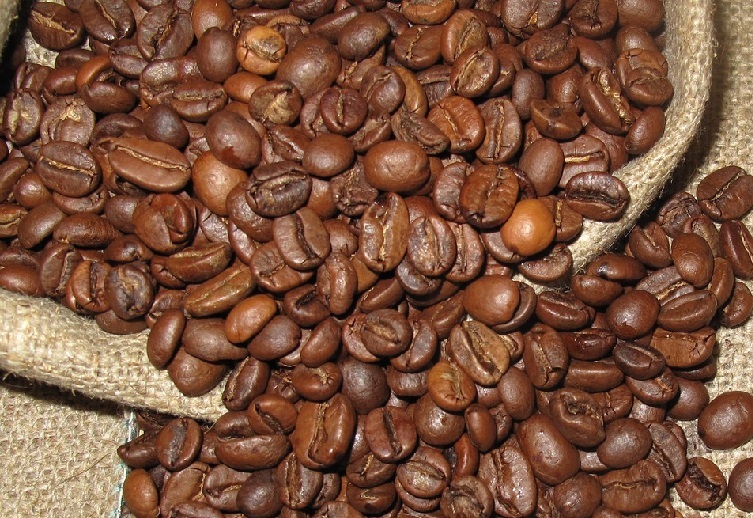 Coffea Arabica – Arabica coffee makes up 70-80% of the world’s coffee market. The Arabica plant originated in Ethiopia, but now grows all across Africa, parts of Asia, Central and South America, as well as Indonesia. Once planted, Arabica shrubs take about seven years to grow sixteen feet high and begin producing fragrant white flowers followed by red coffee cherries. Arabica coffee provides an acidic, yet smooth flavor and if it is high-quality, it can have overtones of fruit, berries and even chocolate. Coffea Robusta – Robusta coffee plants earned their name by being easy to cultivate and pest resistant. Robusta trees grow up to thirty-two feet tall and quickly begin producing 4-8 pounds of coffee cherries every year. Like Arabica, Robusta coffee began in Ethiopia but is now also cultivated in Vietnam, Brazil and Indonesia. Vietnam exports about one million tons of Robusta coffee every year which makes it the largest Robusta coffee producer in the world. Considering all of its positive points, you would think that Robusta coffee would dominate the coffee market, but its flavor holds it back. Robusta coffee is strong and bitter thanks to a higher pyrazine content and it lacks the wide range of overtones that Arabica has. A small percentage of Robusta coffee beans make their way into espresso blends to increase the crema and the remaining beans are processed into instant coffee. Coffea Liberica – Liberian coffee accounts for only 3% of the global market. As its name suggests, it originated in Liberia and surrounding countries. In the late 1800s, coffee rust wiped out the Arabica species in Indonesia and Liberian coffee was planted in its place. Since then, the Philippines, islands in the West Indies, Columbia and Brazil have joined Africa and Indonesia in raising Liberian coffee. Reaching up to sixty-five feet in height, Liberian coffee trees outgrow both the Arabica and Robusta varieties and produce larger coffee beans. Liberian coffee tastes similar to Arabica, but its tough outer hull makes processing difficult and may explain why it is not widely commercialized. Of these three varieties, Arabica has the least caffeine. If you brew a batch of Robusta coffee, it will have about 170 mg of caffeine in every 6 oz cup. Arabica coffee, on the other hand, will decrease your caffeine intake by almost 50% since it contains about 103 mg of caffeine per 6 oz cup. The U.S. Food and Drug Administration and the European Food Safety Authority agree that 400 mg of caffeine each day is generally safe for healthy adults. Doctors recommend that coffee drinkers take time to calculate their daily caffeine intake and do what is necessary to keep it below the 400 mg limit, especially if they have additional health problems. Scientists do not fully understand why, but there are Arabica shrubs which produce coffee beans with even less caffeine than usual. They theorize that genetics and environmental factors may play a part in this anomaly. A few coffee producers have begun investing in research and farming practices which will allow them raise these coffee beans. I hope their products with naturally low levels of caffeine will soon be readily available. Use coarsely ground coffee beans. Finely ground coffee beans release the maximum amount of caffeol, the natural oils which give coffee its flavor and caffeine. Grinding your coffee a little bit coarser will decrease the level of caffeine without noticeably altering the flavor. Decrease brew time. The longer coffee brews the stronger it becomes. Experiment with a shorter brew time or learn to enjoy a shot of espresso, which has a very short brew time and an average of 40 mg of caffeine. Blend your beans. Even if you aren’t a barista, you might want to try mixing Arabica coffee beans with decaf beans until you find a blend that pleases your palate and meets your health needs. Most importantly, remember to enjoy your coffee. We usually consume coffee mechanically without taking time to taste it. If you drink your coffee slowly and savor all aspects of its flavor, you will drink less coffee and enjoy it so much more.